This is the title page of Richard Ligon's 'A True & Exact History of Barbados.' Ligon was a Royalist who escaped some of the troubled politics of England in the 1640s by spending three years in Barbados. In 1650 he returned to England having survived a tropical illness, and was persuaded to publish an account of his experiences. 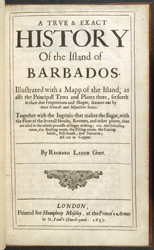 Ligon describes the landscape and climate of Barbados and also includes information about its society and inhabitants, their work, customs and traditions.